They say the definition of insanity is doing the same thing over and over again and expecting different results. Well, Jon Jones (Pictured) isn’t searching for unequal outcomes having posted a perfect 4-0 mark in 2011, but the reigning UFC light heavyweight king is looking to replicate last year’s insane schedule. “I’ve been thinking recently about trying to compete four times in the year again,” Jones told ESPN. “I grew so much as a person that by doing that again in 2012 will just make me a better athlete. During Jones’ 2011 campaign, he trounced four opponents, three of which were former title holders, en route to becoming the youngest champion in UFC history. It was arguably the most masterful year mixed martial arts had ever witnessed. Unless rematches are set, Jones won’t face as many prior champs in 2012 as he did over the last 12 months. The only relevant former hardware holder he hasn’t fought is bitter rival Rashad Evans. Regardless, “Bones” makes no bones about his intentions on continuing to produce highlight-reel finishes no matter who stands in his way. He believes convincing conclusions are how legends are made. “My goal is to finish every fight in 2012. If I do that, a lot of other things will fall into place naturally. 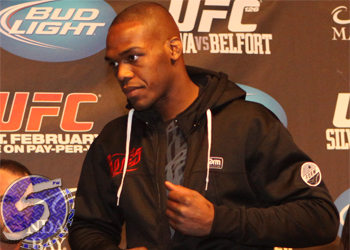 I want to finish every opponent,” Jones said in closing.